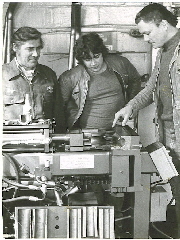 From 1957 to 1963, Roger Girard worked for Pinch Esso as a service station attendant and part-time mechanic. In 1963 an opportunity came up for Roger to purchased the station from John Pinch which he did on April 1st of that year. A lot of hard work came from this purchase including many expansions and renovations, and the addition of a car sales lot (1988). Ralph (Raoul) started “working” early in his life. Memories of the 6 year old walking over a mile to the garage just to help out, still make Roger smile. Now the roles are reversed. With Roger finally FULLY retired, Ralph is the sole owner of Girard Esso and until just recently, you’d still see Roger head out to the garage on his scooter to help out or bring the mail. Not only has Ralph taken over the business, his son Trevor is waiting for the reigns to be passed down once Ralph decides to retire. Trevor has been working at the garage since the age of 12 and is now a licenced Class A Mechanic and is very knowledgeable with the mechanics of most vehicles!